The lecture of Gabriel Castillo will demonstrate different traditional manifestations of Peruvian textiles since the pre-columbus time, passing through the colonial process, until current times. Castillo will take a formal and semiotic look into the myths and constants that he can find in the textiles, their value and transcendence. He will investigate their influence on traditional and contemporary expressions in relation to the arts, the aesthetics, and the vitality of the Peruvian reality. 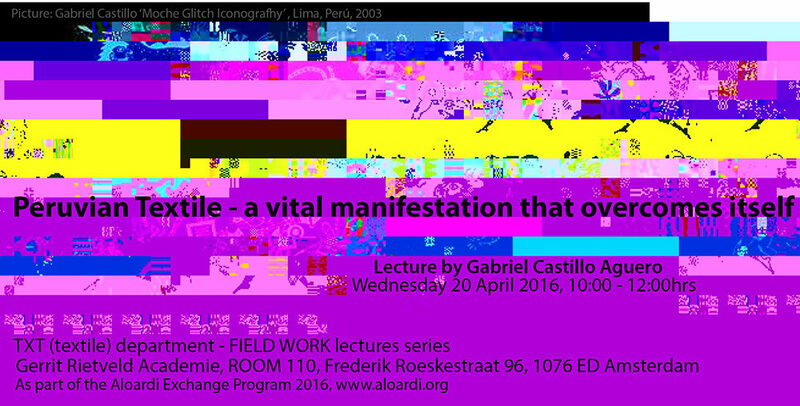 The lecture is open to the public (free entrance). It will be in Spanish with a live translation into English by Christian Galarreta. Janneke van der Putten will also give a short introduction of Association Aloardi and her experiences during the Aloardi Research Trips 2015 in the Peruvian countryside. Gabriel Castillo Aguero (1975) is a visual and sound artist with a background in History of Arts, graduated from “Universidad National Mayor de San Marcos”, Lima – Peru (2006‐2000). In his artistic work Castillo makes drawings, video, and experimental music, developing visual and sound discourses related to analogue and digital errors. He is interested in the popular culture and the craft of constructing electronic circuits as musical instruments.